We think of bees as being among the busiest workers in the garden, admiring them for their productivity. But amid their buzzing, they are also great communicators—and unusual dancers. As Karl von Frisch (1886–1982) discovered during World War II, bees communicate the location of food sources to each other through complex circle and waggle dances. For centuries, beekeepers had observed these curious movements in hives, and others had speculated about the possibility of a bee language used to manage the work of the hive. But it took von Frisch to determine that the bees’ dances communicated precise information about the distance and direction of food sources. As Tania Munz shows in this exploration of von Frisch’s life and research, this important discovery came amid the tense circumstances of the Third Reich. 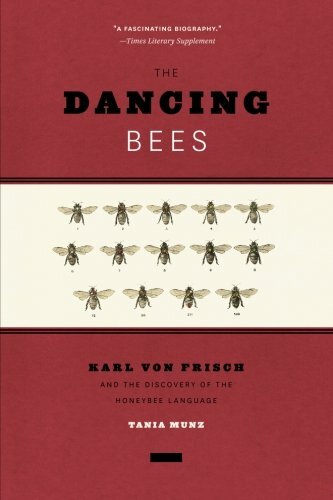 The Dancing Bees draws on previously unexplored archival sources in order to reveal von Frisch’s full story, including how the Nazi government in 1940 determined that he was one-quarter Jewish, revoked his teaching privileges, and sought to prevent him from working altogether until circumstances intervened. In the 1940s, bee populations throughout Europe were facing the devastating effects of a plague (just as they are today), and because the bees were essential to the pollination of crops, von Frisch’s research was deemed critical to maintaining the food supply of a nation at war. The bees, as von Frisch put it years later, saved his life. Munz not only explores von Frisch’s complicated career in the Third Reich, she looks closely at the legacy of his work and the later debates about the significance of the bee language and the science of animal communication. This first in-depth biography of von Frisch paints a complex and nuanced portrait of a scientist at work under Nazi rule. The Dancing Bees will be welcomed by anyone seeking to better understand not only this chapter of the history of science but also the peculiar waggles of our garden visitors.